for Mom and her children! A man from the past who actually lived one block adjacent to Mom and Dad’s home years before. What was even more miraculous, this man’s wife and Mom were best friends before her death. Offering his condolences, he frequently drove the three hours to visit Mom who had moved with Dad year’s before to the mountains One day the world exploded with the start of courting. Who courts at seventy-nine years young? Not for long, this ensued for six months until we children individually got the call. “Will it be acceptable if I marry your Mom? I love her very much and will always take care of her; she will never need for anything.” With this meaningful request, how could we say no? The marriage was hastily planned by my brother, sister and me from various parts of the United States scurrying about – it felt like a shot-gun marriage with our hustle, but at their advanced age, why wait a second more of life to go by? 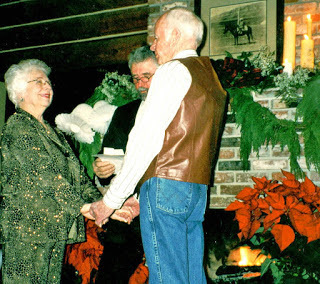 Just a day before the couple arrived in Idaho from California, my sister had secured a minister from her small town, willing on Christmas Eve, precisely at 7:00 PM, to drive up a dark mountain and appear at her log cabin perched on an 80 acre snow laden hilltop in the boonies. He did, they did, marriage vows were spoken to each other as they tightly clasped hands by candlelight, a fire in the hearth behind, children, grandchildren and even great-grandchild on its way in a mom’s belly, completed the I DO’s. Champagne corks flying and the feast, celebration and joy ensued. I have always wondered how this love and union was found and consummated at their advanced age of 80. I believe it is what courage consists of. To step out on the abyss with wonder and hope for a good future, abet it might be a short one, but to take a chance of what might lay ahead—whether it be devastating or a blessed communication of two spirts now joined as one on a path; it is a miraculous leap of faith. God Bless Them—they have prospered in wedded bliss for fourteen years, much longer than what they suspected might be a few, as their love grows daily.